Tanja graduated with a Doctor of Philosophy (Arts) in Media and Communications from The University of Melbourne in 2013. 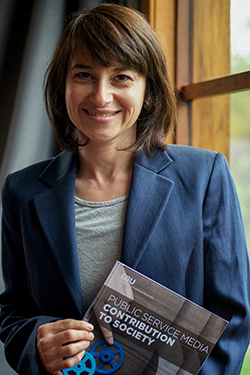 Tanja's role was created for an EBU initiative - The Public Service Media Contribution to Society Project - which aims to expand the role of public service media to focus on delivering societal value. Tanja's role involves sharing these insights in a variety of ways: managing social media groups to facilitate knowledge exchange, producing research documents, developing guidelines. Above and beyond this, her role is to provide inspiration and advocacy for a new mindset for public service media which focuses on their contribution to society. Tanja's career thinking as she neared PhD completion was to work in audience and market research; she had no plans to become an academic. But the future had something more specific in store.